Many people have a belief that if I'm busy, then what I am busy with must be important. work from someone over us that they deem as important. Unfortunately, many of us get trapped into other people's last minute projects with tight deadlines that cause us to drop what we are doing that could be important to our own workload. emergencies that are urgent and important. Unfortunately, things happen that cause us to take our attention off of our long-term important actions. some frivolous communication such as email, phone calls, and social networking. Not all of this, of course, is unimportant, but I do think that we have a tendency to use this as a distraction or a crutch to avoid truly important intellectual labor. busywork that is neither urgent and important. This could be anything from reading mail, sorting papers, cleaning off your desk, or reorganizing your files. While all of these things need to get done at some point, we all have a tendency to fall back on these tasks while we procrastinate on what truly matters. Whenever you feel distracted by this style of busy work, stop and reevaluate your priorities during your workday. Take the time to focus on 2 or 3 tasks that really matter to your long-term success in your job, your business, your calling, or your family. Perhaps you need to schedule a lunch with a mentor that can expand your thinking, or attend a conference where you will be inspired to reach greater heights. Maybe you need to spend some valuable time just researching and thinking through a difficult decision you need to make. Whatever the more important tasks might be, don't settle for just being busy. 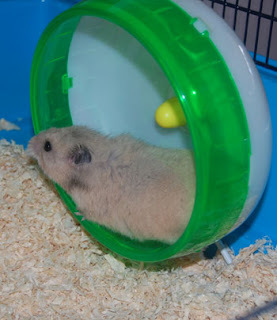 A hamster on a wheel is really busy, but getting nowhere.